Considering the important role that rivets play in many industries, it is crucial to ensure that you choose the right type of rivet. Cold headed rivets provide a number of advantages over machined rivets. One of the main reasons that many firms choose cold headed rivets over machined rivets is the substantial cost savings they present. While cost should never be the only factor taken into consideration when choosing a rivet, it is naturally an important factor for many companies. The cold heading process is also sometimes referred to as cold forming. This process is much faster as well as more efficient than machining when producing standard as well as special rivets. While this technology has existed for many years, it still offers numerous advantages over more modern machining techniques. In the cold heading process, a piece of wire is segregated and pushed into a die. The protruding end of the wire can then be placed in the outward direction to form the heading. Metal can then be formed on the same axis. When a rivet comes off the cold header, it is typically either already complete or nearly complete. This allows for much faster production. In addition, the cold heading process produces very little scrap. This can present excellent raw material savings, particularly when compared to machining. Cold heading can also be used as a primary process in conjunction with secondary machining in situations in which tighter tolerances are required. Along with providing for consistent tolerances, the cold heading process also allows for high speeds and is ideal for orders in which large volumes are required. When you need large minimum orders with tight tolerances, cold headed rivets can be a good solution for providing high quality at low costs. 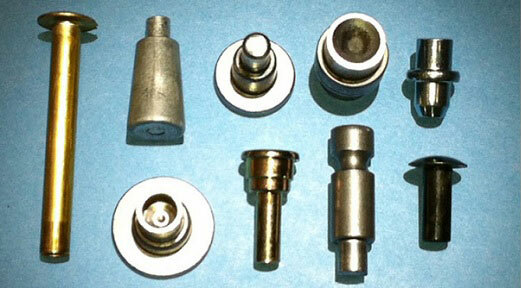 In order to take full advantage of the benefits offered by cold headed rivets, you will need the right supplier. As part of the process of choosing a supplier for cold headed rivets, it is important to ensure that the supplier you choose has significant experience with producing rivets using the cold heading process.